How can we create a more sustainable world? What type of thinking and action is required? 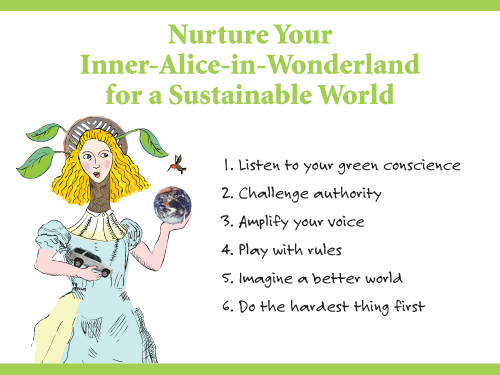 Franke James believes we need to nurture our inner “Alice in Wonderland”—and be ready to challenge the powers that be, conventional wisdom, and the old ways of doing things. Franke draws on a real-life story to illustrate how she made change happen—and how you can too. Paradise Unpaved tells the story of how Franke challenged City Hall for the right to build a green driveway— and won. With artistic flair and political savvy, Franke outlines her six rules for creating a more sustainable planet: 1) Listen to your green conscience 2) Challenge Authority; 3) Amplify your voice; 4) Play with rules; 5) Imagine a better world; and 6) Do the hardest thing first. She also gives examples of how these six rules are currently being applied around the world and how they are leading to a more sustainable world. 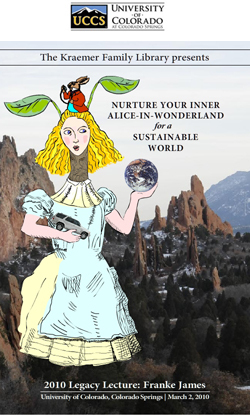 Franke is an artist and the author of Bothered By My Green Conscience, the illustrated tale of her true-life adventures in going green. She has a Masters in Fine Art from the University of Victoria, and a BFA from Mount Allison University. Reception 11:45 a.m. – 12:15 p.m.
Lecture 12:15 – 1:45 p.m. The Legacy Lecture Series was established by Jane E. and Douglas R. Johnson in 1989 on the occasion of Doug’s retirement as Director of Admissions after twenty years of service at UCCS. The endowment provides for the support of lectures, symposia, and workshops by people whose lives, works and philosophy have made a difference in how we see ourselves and how we function as a humane society. Additional support for this lecture provide by the Kraemer Family Library Endowment Lecture Fund, Provost Office, Campus Student programming team, Department of Geography and Environmental Studies, Department of Visual and performing Arts, and the Office of Student Activities. Air Force Officers Wives Club, William Alt, Andrea Arthurs, Margaret (Peg) Bacon, John Bartram, Norm bender, Jackie Beyer, Esther Beynon, Muriel Claflin, Rita Compton, Anna Daniel, Warren Ehrmann, J.K. Emery, Executive Office Service, Bev Finstrom, Bill Fischer, M. Lynette Ford, Elizabeth L. Forney, Lee Green, Pat Green, Cindy Hand, Vorda M. Hannold, Janice N. Hayes, Max Henne II, John Hostettler, Gretchen Howard, Stephen Hoyle, Diane Hughson, Paul Hulquist, Geraldine Irving, Bryan G. Johnson, Jane Johnson, Randy Kouba, Jonita Mallon, Leslie Manning, James Mattoon, Byron McCalmon, Anne D. McLaughlin, Ken Meisinger, Ann Nelson, Bert Nelson, Sharon Oleszek, James Null, John Ormanoski, Ed Osborne, Carol Pierce, Ann Reeverts, Hubert Rodman, Libby Silverman, Kimberly Solberg, Jo Stansborough, Storage Tek Corporation, Elizabeth Stine, Marlys Trees, Jane Trogdon, UCCS Accounting Bursar, Douglas Wasson, Doris (Peg) Whitten, Ron Wisner, Laila Wood, Howard Yambura, Bill Young, Sandra Ziemer.